Every year our chapter has to renew the $10,000 it spends on our activities, which carry on our mission of protection of the environment through education, appreciation and conservation. The largest source of the renewed funds is from your donations for our Birdathon fundraising event. Please consider donating or being a Birdathon team member. Our Board has focused this year on water issues of the Apalachicola River drainage by sponsoring speakers involved with researching the area, participating in and sponsoring the recent Apalachicola River Conference, donating to the Big Bend Environmental Forum, and funding Gulf Specimen Marine Lab efforts to save turtles rescued from the extreme cold weather. 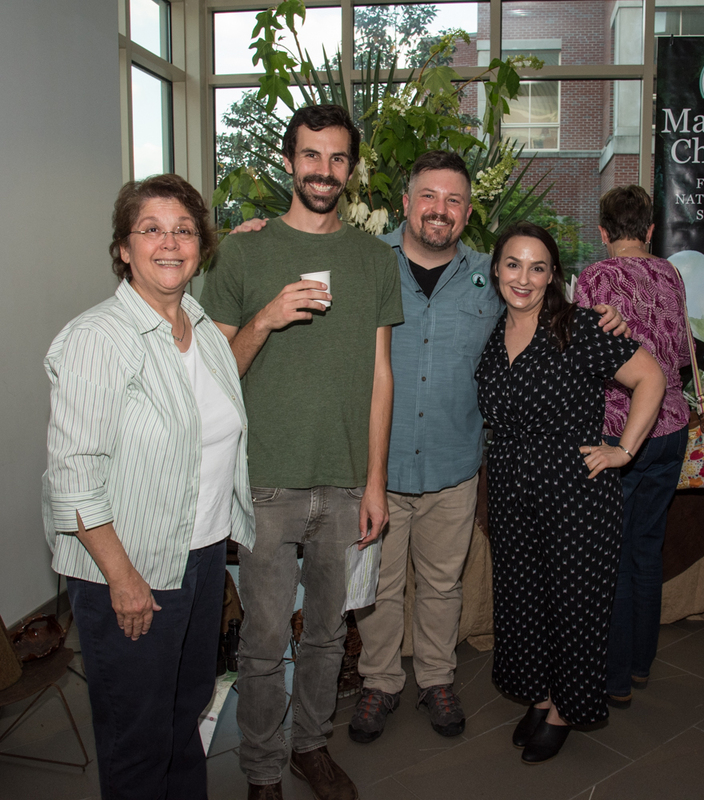 In addition, we have a presence at numerous wildlife events such as the Butterfly Festival at St. Marks Wildlife National Refuge (SMNWR), provide field trips to our members, and educate the public about environmental matters, birds, and Chapter events. This year our educational efforts included financing 5 buses for public school classes to make field trips to SMNWR. For many kids, it was a first time to even see marshes and the coast. We introduced some southside kids to birding and also created an after-school bird club at Pineview Elementary School. Their staff and kids enjoy the bird feeder and butterfly garden we set-up and maintain with the help of Native Nurseries. We continue to offer elementary school teachers in four counties subscriptions to the environmental education classroom kit AUDUBON ADVENTURES. We plan to grow our educational presence in the community in 2018-2019. During Birdathon, usually any 24 hour period in the April spring migration season, volunteer teams try to identify as many bird species as they can. The team members secure pledges from friends and members, either per species or by fixed amount contributions. For example, a pledge of 50 cents a bird might cover the cost of one subscription to AUDUBON ADVENTURES if a team were lucky enough to identify 100 bird species. Or a flat donation of $50 would cover a subscription cost. If you would like to be on a team or sponsor a team member, please contact Judy Goldman at Goldman@hep.fsu.edu. 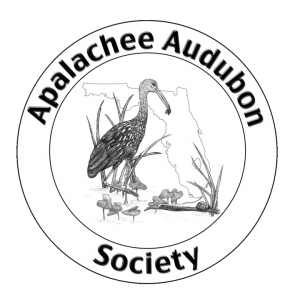 Donations may be mailed to Apalachee Audubon Society at P.O. Box 1237, Tallahassee, Fl. 32302-1237. 2018 Yard Tour: A Definite Success! Thank you for a great 2018 Wildlife-Friendly Yards Tour! The weather was sunny and warm, and made for another wonderful tour this year. Every yard had a constant stream of visitors throughout the day. Having sold 137 tickets, attendance was up from last year’s rainy day, and made a very successful and fun tour. We had had so many wonderful people working behind the scenes for months to bring it all together. Everyone’s contributions and outstanding efforts are very much appreciated. Special thanks to the Tallahassee Democrat for publishing our article and pictures on the front page of the Chronicle. There is no doubt this helped increase awareness and introduced some new people to our yard tour tradition. Another special thanks to Native Nurseries and Wild Birds Unlimited. Once again they have graciously acted as our ticket outlets as well as promoted the event, and we couldn’t pull this off without them! Our deep appreciation goes to our five outstanding yard hosts this year, who shared their homes and knowledge with friends and strangers. They truly went above and beyond! Upon arriving at Pat and Mike Meredith’s, there was a steady steam of visitors up and down the back yard to the edge of Lake Jackson. Spotting scopes, courtesy of Sally & Dean Jue, Jim Cavanagh, and Ed Woodruff, made for excellent water bird viewing. A total of 6 Limpkins were seen throughout the day, which we would have been unable to detect them without the scopes. Truly a unique experience! Just a short distance away in Hunter’s Crossing was Susan and Clay Thompson’s bird sanctuary. They graciously offered inside viewing (along with snacks and drinks!) from their bird window, offering a close-up view of their feeder station with the neighborhood pond as a back-drop. Upon arriving, a hawk was perched in a tree close by and an egret was at the water’s edge. One of the day’s volunteers, Jake Hartung, counted 23 species of birds while he was there! 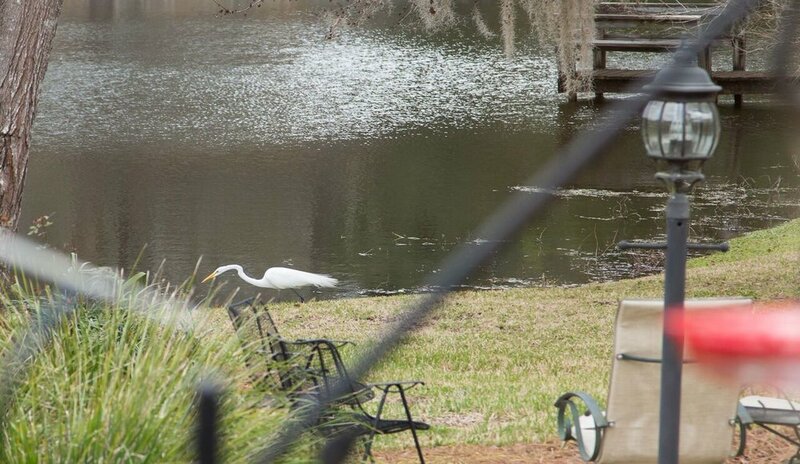 Over in Killearn Susan Cason’s yard offers a wonderful retreat for wildlife. Many feeders, nesting boxes, native plants and a water feature attract a wide variety of birds to her yard year-round. Viewing from her back yard featured a beautiful over-all view, while meandering around the back yard offered many inviting nooks and benches to relax and enjoy the native plantings and closer view of the many songbirds in this active yard. Susan’s knowledge and experience no doubt enhanced her guests’ visits and viewing. A quick few-minute drive to Rob Williams and Lynn Peterson’s yard in Foxcroft also yielded many native plants along with their bird feeders and baths. 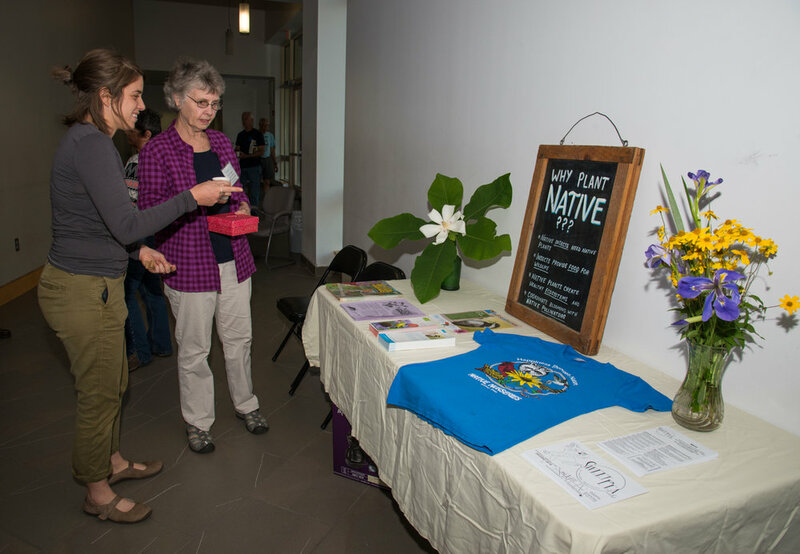 Rob put together a wealth of information and an identification system for his native plants that everyone enjoyed and learned from. Rob and Lynn’s passion, enjoyment and knowledge of native plants and trees made for plenty of interesting conversation. Many guests also enjoyed a short walk in the woods at the back of the property, as well as the many turkey vultures that regularly gather overhead toward the end of the day. I think a lot of us are familiar with Glenda Simmons’ home, most famous for her numerous bluebirds and orioles. Glenda was a yard host in 2011, when she had recently landscaped with native plantings. The plants have grown beautifully and are a perfect backdrop for her bird feeding stations and bird baths, and provide areas of shelter for the numerous birds on her property. Glenda graciously made a beautiful display of photos of all her orioles, introducing them by name. Yes, they are named, and each one is quite fitting! A fun ending to a wonderful day with some great people. Heartfelt thanks go to all our wonderful yard volunteers, too! They certainly helped the visitors have a friendly and informative visit, and we couldn’t do it without you. Our yard volunteers this year were Adrienne Ruhl, Dee Wilder, Fran Rutkovsky, Michael Tucker, JoAnne Harrington, Diane Sigler, Diane Quigg, Pat Teaf, Helen King, Jan Blue, Karen Wensing, Kathleen Carr, Judy Goldman, Jake Hartung, Ann Bruce, Holly Thomas, Sally Jue, Dean Jue, Jim Cavanagh, and Ed Woodruff. With all the fun and success, we are already thinking about next year’s tour, so please keep it in mind if you know anyone who would be a good yard host or volunteer to be a part of this wonderful experience. Again, my deepest thanks to all for your contributions, each one of you was a vital part to the enjoyment and success of this year’s tour! Where to begin? Perhaps I should start with where I went, and why. Last December, I traveled to northern India and southern Nepal with a girl I knew well enough to go abroad with but, really, not well enough to go abroad with. We went anyway. The goal was wildlife and experiences. Boy, did we have plenty of both. Our route essentially took us on a circuit through north-central India and through the southwestern corner of Nepal. Though we had a lot of "target species", money was never in abundance. We decided to skip the organized tour route and do our own thing. When I describe what we were able to see with this strategy, you may be tempted to try it. When I describe the hardships, you may call your nearest tour operator. Driving through India is akin to a real-life Frogger with the decibels of a rock show blaring at you in the form of car horns at all times. The wildlife portion of our trip began when we left smoggy, grimy New Delhi and arrived at Ranthambore National Park. Here, we observed brown fish owls, Indian peafowl, dusky eagle owl, and plum-headed parakeets to name just a few of the many birds spotted while on safari. I was fortunate to get an up-close look at a massive female Bengal tiger that absolutely blew my mind. These sightings, combined with gray langurs, mugger crocodiles, mongoose, wild boar, and two deer species all amidst orange-tan tropical dry forest, made up for all of the hassles that came before it. I'll spare you details about the next leg of the trip, considering that it involves some highs (Taj Mahal, shooting stars over the mountains of central India) and some lows (trip to the hospital and a police officer beating up our driver while demanding payment, cancelled train). But, stopping to look at a flock of sarus cranes in a field north of Lucknow, India while Indian rollers perched on powerlines overhead made up for any headaches acquired previously. Then we were in Nepal. I can't stress enough how amazing southwestern Nepal is. We purposefully avoided areas where tourists/organized tour groups generally go, and we were so glad that we did. Sure, it was somewhat expensive to get to the Bardia Homestay in middle-of-nowhere Nepal on our own. And, yeah, we probably could have seen more species. But the species we did see, and encounters we had seeing them were unforgettable, unique, and amazing. Did we climb any Himalayan peaks? No. Did we check off every species of bird known from Bardia or Ranthambore National Parks? Definitely not. What we did do is have the trip of a lifetime that, despite some very real challenges, rewarded us in ways we are still realizing months later. Besides, the privilege of seeing some of that wildlife is something that, at least to me, is worth almost anything. I've never felt more motivated to work in the field of wildlife conservation and to continue traveling, in order to see what other wonders this world has to offer. Over 70? You Can Help The Birds of St. Vincent NWR With Little Effort! I have one of my IRA's at Vanguard Mutual Funds. Being over 70 1/2 years old I am required to take what is called required minimum distribution (RMD), the entire amount subject to federal income tax.. However (one of the few perks left for being old), anyone 70.5 years and older may have a check(s) made out to an IRS listed 501 (c) (3) organization, which Friends of St. Vincent NWR is. I am having Vanguard make out a check for the amount of my contribution to "Friends of St. Vincent NWR". I can have Vanguard mail that to the Friends at PO Box 69, Apalachicola, FL 32329 or mail that check to me. I am having them mail this check and other checks to other 501 (c) (3) organizations so I can make a copy of the checks as confirmation of these donations. Vanguard will also be sending me a confirmation statement. In January 2019, I will receive a 1099-R from Vanguard, indicating that I have made the required distribution. (Failure to make the required distribution will result in a hefty tax penalty.) On my 1040 tax form next year where the form asks for IRA (qualified plans) distributions, I will enter the amount on the 1099-R. However, since I made a contribution to a 501 (c) (3), I note the amount of the qualified distribution on that line and on another line the actual taxable distribution amount is reduced. Even though I have a confirmation from Vanguard noting the qualified distribution, having copies of the checks with the names of the 501 (c) (3) entities names is backup documentation should I ever get audited. Vanguard assures me that this is in the law for 2018. We, older seniors, can use it as a donating strategy for gifts to all 501 (c) (3) organizations. The taxes we save can be considerable (multiply the aggregate qualified charitable contributions x tax rate and that's your savings). If you're in that small group who believes that you should pay your share of taxes, donate that savings and consider it as a redirection of your tax to more socially or environmentally directed purposes. Not all IRA providers may allow this; although the only problem I see is that some may establish a minimum amount they would cut a check for. On Saturday, November 18, Apalachee Audubon member Madhu Nepal and I took the Hewitt children (of AAS banquet fame) and their mother to the SMNWR for a birding expedition. Their behavior at the refuge reflected skills and attitudes modeled by AAS birders Judy, Peter, Rob and Dee. My most memorable moment of the morning was when, having spied the vermillion flycatcher on the pier at East River Pool, they tiptoed slowly, silently out to see him, five abreast. Joyously, they continued to follow his movements – from pier to reeds and back again. On the 25th I took four children from the Luhembwe family to the refuge. These refugee children, born in Southeastern Congo, had never been birding before, and they were very excited to be there. At three or four stops along the way they were helped to look through the scopes and binoculars of kind strangers and, later on at Picnic Pond, Ted and Mary Ellen Greenwald photographed us and later sent the photos, along with an invitation to visit the butterfly jungle in Gainesville. The sighting of the vermillion flycatcher, a pair of white-winged doves, eleven wood storks in trees near the road, and the eagles at their nest were all noteworthy. For the children though, it was seeing two alligators that made the day!